Our Three-Ingredient Bolognese Pasta Bake couldn't be easier. 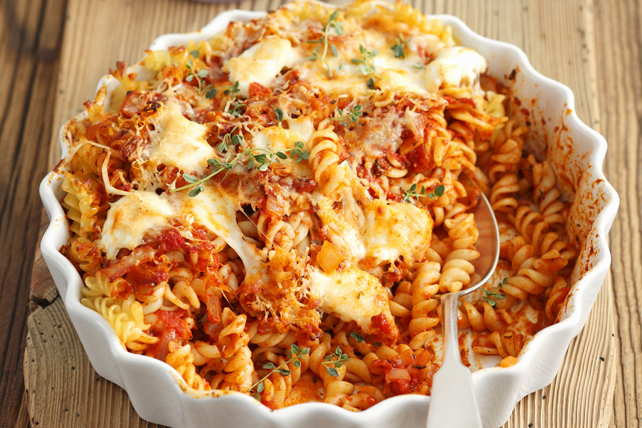 Fusilli pasta, CLASSICO Pasta Sauce and CRACKER BARREL Shredded Cheese are the only ingredients you need for this delicious pasta casserole. Drain pasta, reserving 1/4 cup cooking water. Return cooking water to pan; stir in pasta sauce. Bring to boil, stirring frequently. Remove from heat; stir in pasta and 1 cup cheese. Spoon into 2-L casserole dish sprayed with cooking spray; top with remaining cheese. Cover. Bake 25 to 30 min. or until heated through, uncovering after 20 min. Cool, then refrigerate any leftovers. Reheat and serve as part of your lunch the next day. This satisfying casserole can be mixed together ahead of time. Refrigerate up to 24 hours before baking as directed, increasing the baking time if necessary until casserole is heated through.